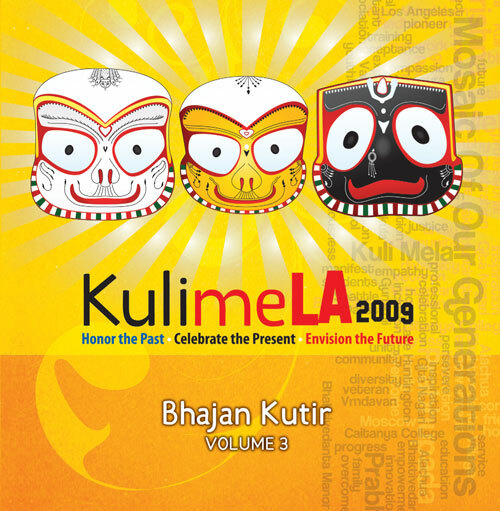 In anticipation of the upcoming Kulimela Australia festival, the KM09: Bhajan Kutir CDs – Volumes 1, 2 & 3 are now available for complimentary listening and downloading. CLICK HERE to listen and download free MP3 digital copies. Add them to your playlist today! This selection of heartfelt kirtans was recorded live in the KM09 Bhajan Kutir at the ISKCON New Dwarka Temple in Los Angeles CA, USA. 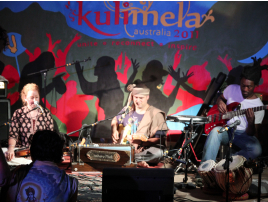 A “Bhajan Kutir” is a special place dedicated to Kirtans. Additional thanks and credits to: Vrindavan Favors as Bhajan Kutir organizer * Los Angeles ISKCON New Dwarka Community as gracious hosts * Szymon Potynski & Rasikananda Fitch for graphic designs * Jaya Balarama dasa as sound engineer * Rupa Schomaker for recording, editing and mastering the tracks * Kamal Vyas & Chaits Walker as producers. The Kuli Mela Association is a 501(C)(3) non-profit organization dedicated to serving an international community by supporting and encouraging its members to come together in service, association and empowerment, with a strong emphasis on spirituality. C + P 2009 Kuli Mela Association. All rights reserved. 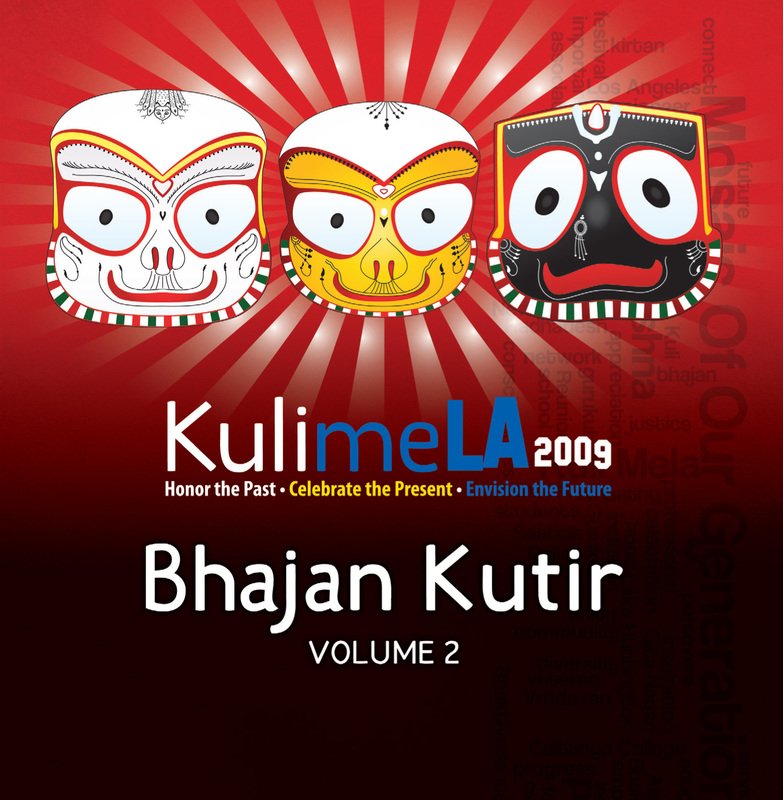 CLICK HERE to check out the growing video and audio selections at the Kuli Mela Outlet on Krishna.com. 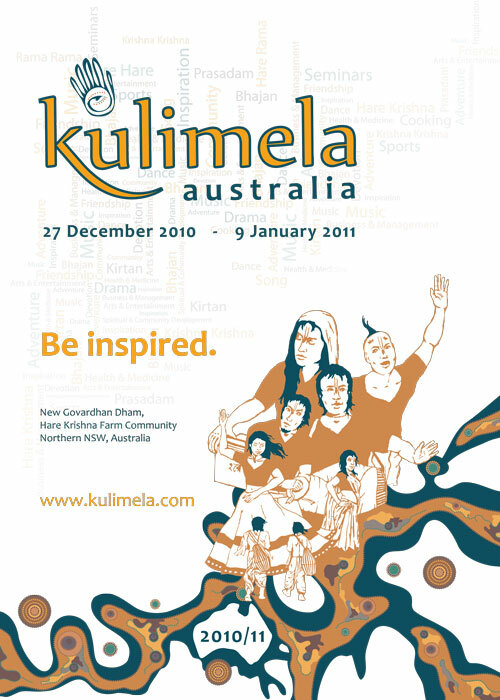 PLEASE NOTE: The first 400 people who register for Kulimela Australia 2010/2011 will be getting a complimentary copy of the KM09 DVD at the event. 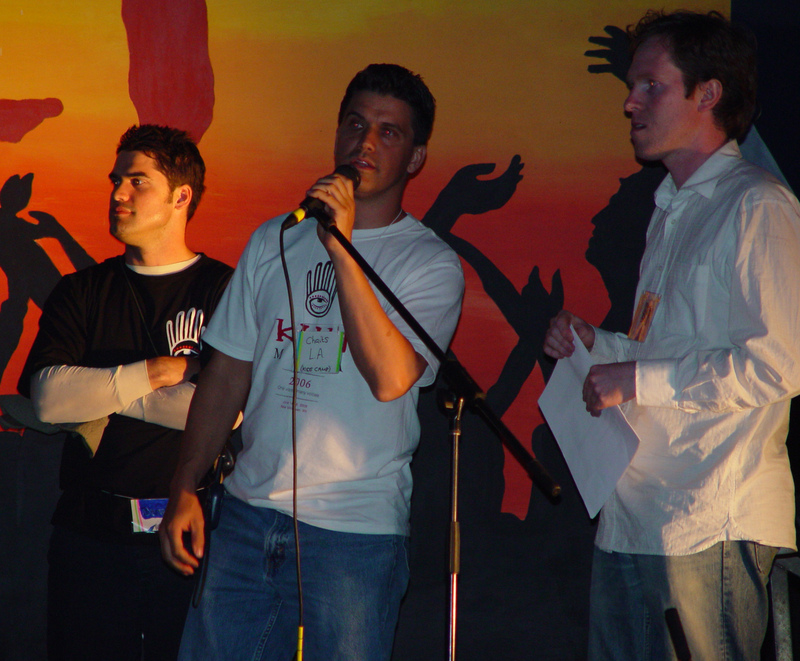 CLICK HERE for more information about the upcoming festival. If you plan on going, we encourage you to take advantage of the early bird discounts and pre-register now! 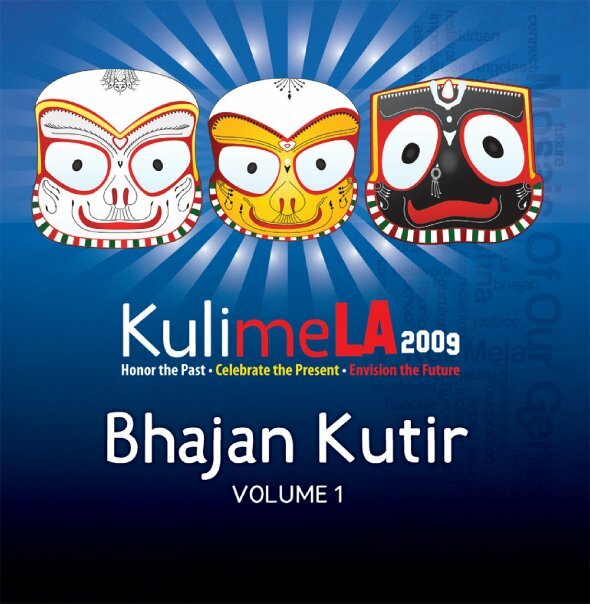 Originally posted by the ISKCON News Staff at the ISKCON News website on December 17th, 2010. 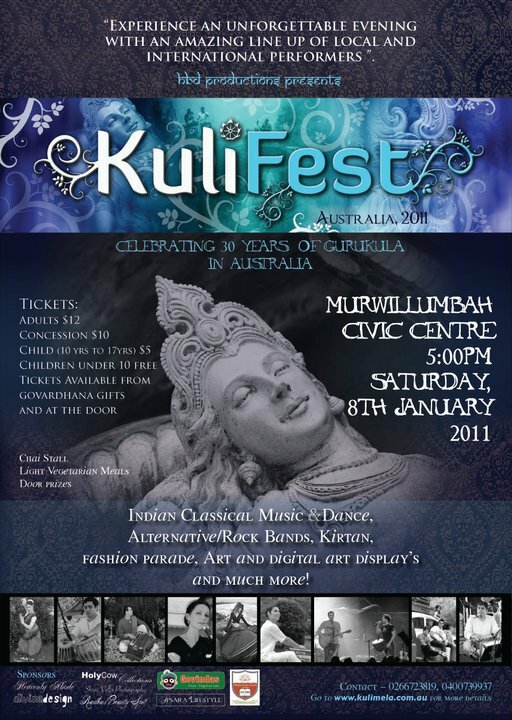 The local Australian Gurukulis are putting together a Kulimela event which will be a spiritual gathering of Gurukulis from all over the world focused on bringing everyone together, making connections and friends, inspiring and helping one another in including Krishna in their lives. 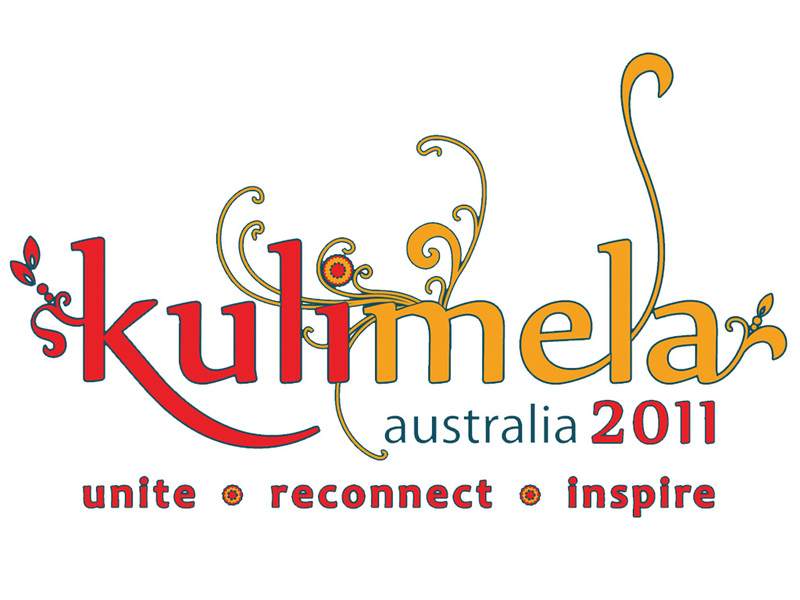 Kulimela Australia will be drug and alcohol free and will be packed with productive seminars focusing on Health and Medicine, Business and Management, Spiritual and Community Development, and Arts and Entertainment. There will be discussions, bhajans, temple programs, japa walks, sports and various other activities. It will be held on New Govardhana and it has the support and backing of the temple management and many senior devotees and Srila Prabhupada disciples. 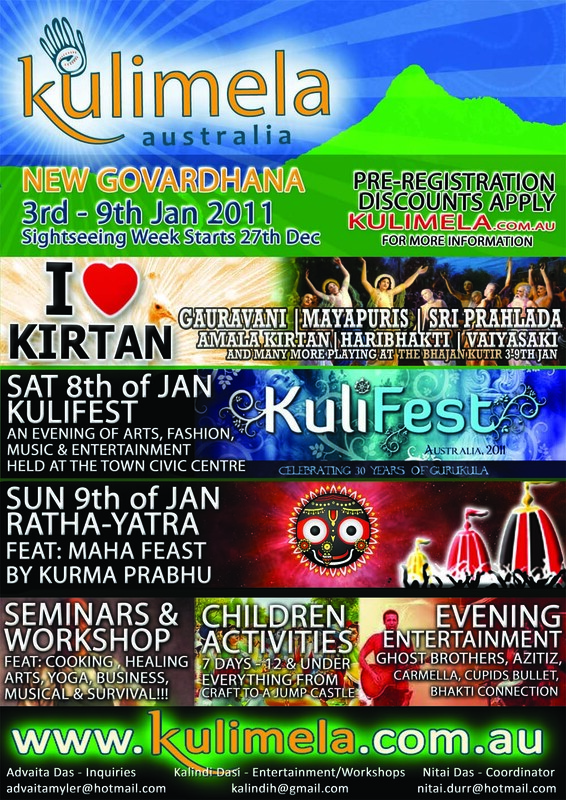 It is open to all devotees and Gurukulis from all over the world and will coincide with the New Govardhana Farm Festival, running from the 27th of December 2010 to the 9th of January 2011. The first week of this will be an opportunity for the Aussies to show the guests a bit of their beautiful country and culture. There will be daily excursions to local attractions, beaches and national parks, bush walking, japa walking, bhajans, sports, prasadam and getting to know each other activities. 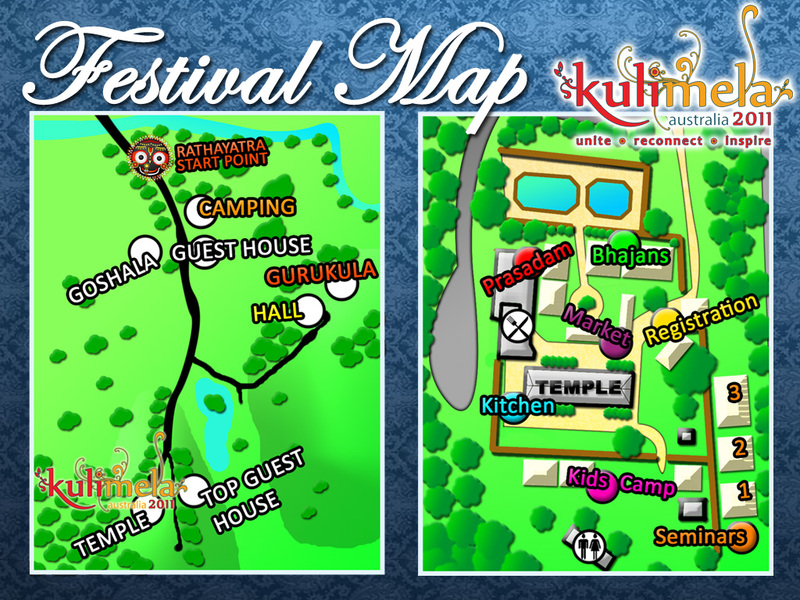 The second week will be broken up in to two parts: The first three days will be a Krishna culture healing music festival and the second four days will be the official Kulimela part of the festival with a full schedule of seminars, arts, spirituality and entertainment. 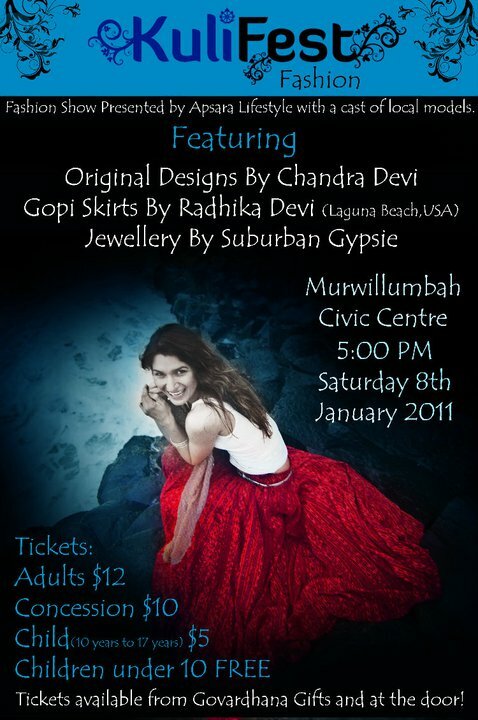 There will be a number of local and international artists such as Gaura Vani and the Ghost Brothers. 2:00 pm to 4:15 pm Bhajans in the Alachua ISKCON Temple. To view the live video feed, click on the following link: Alachua Temple Live (Courtesy of Krishna.com). Here are some thoughts, feelings and expressions from the first day of amazing 12 hours of Kirtan! What a nite. AMAZING BHAJANS AND KIRTAN. I LOVE BEING A HARE KRISHNA. WHAT AN AMAZING BEAUTIFUL LIFE WE HAVE. What a day….Priceless….! Kirtaniya Sada Hari!! 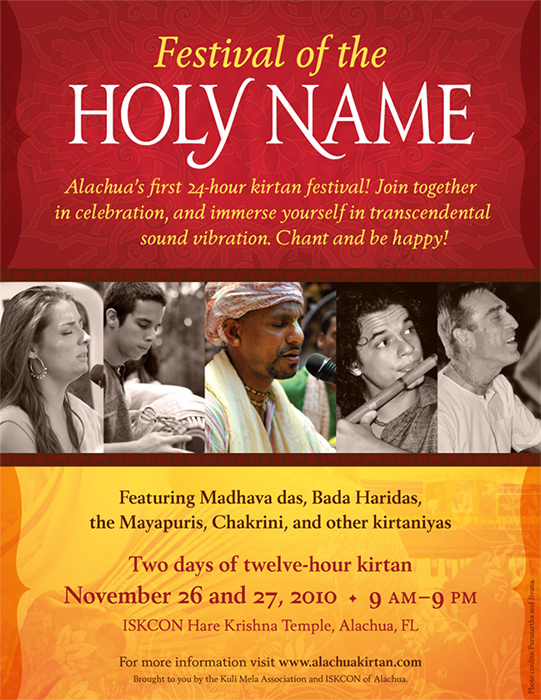 The waves of Kirtan are crashing, the sound of drums thundering in our hearts… and the demigods have responded with cooling showers… It’s ALL happening in Alachua!! ‎12 hours in… 12 hours to go… this is turning out to be maha magic! Bliss! I am thankful for my beautiful family of kirtaniyas. Thank you Nitai Gaura Chandra! What an amazing day at the Festival of the Holy Name! Tomorrow we continue with another 12 hours of amazing kirtan. The LIVE webcast continues at 9:00 AM Saturday, November 27th (EST USA) and will continue until 9:00 PM and beyond. Audio recordings, video clips and photos are being posted regularly throughout the festival on the Kulimela Association Facebook page, as well as the Festival of the Holy Names Facebook event page. Brought to you by the Kuli Mela Association and ISKCON of Alachua. Live video webcast courtesy of Krishna.com.